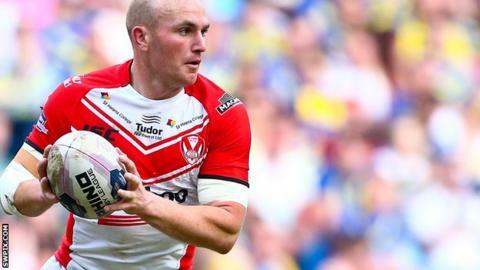 St Helens boss Keiron Cunningham says scrum-half Luke Walsh will not be rushed back before their World Club Series meeting with South Sydney Rabbitohs later this month. The 27-year-old has not played since breaking his leg against Widnes more than six months ago. Cunningham said Walsh would not be risked against Salford next week. "I'd be a fool to bring him back early when there is another 10 months of rugby to play," said Cunningham. Walsh, who still finished last season as Saints' leading scorer, had only started light training in the lead up to Friday night's 18-7 season-opening win over Catalans Dragons. While victory marked a successful start to Cunningham's tenure as Saints boss, he criticised match officials for making an overzealous start to the new Super League season. Both sides had players sin-binned in a game which saw 20 penalties awarded, while there were also yellow and red cards shown in Thursday's draw between Widnes and Wigan. "The most disappointing thing for me is that the fans have waited so long for the season to start and after two TV games all people are talking about are the referees' decision," said Cunningham. "We just want to play rugby league."